For the past few years, I have toyed with the idea of taking Sydney up high with me. So I started asking a few years ago and got a solid NO from Mom. But that’s how you start. Soften year by year. 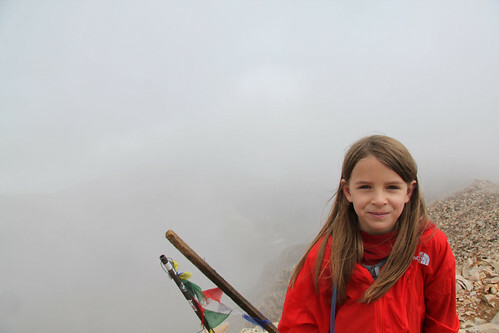 So finally this year, Sydney had to go on a longer hike for her hiking scout badge. I quickly was given the task of making that happen. 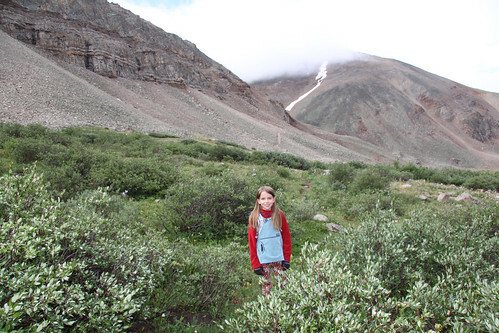 Given the fact that I don’t like to do anything normal and the fact that all the trail I know are mostly in the vertical direction, I quickly settled on Mount Sherman for her hiking badge outing. 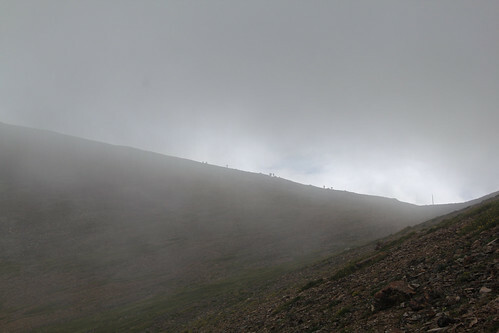 Sure, a 14er. At 9 years old. Let’s see how it goes! We did Sherman from the west side which is a new route for me. I had done it from the east years ago. 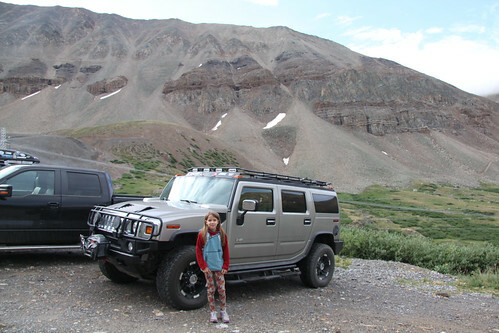 We drove up to the Iowa Gulch trailhead at about 7 AM just after the rains had stopped. It wasn’t a perfect day. It was cooler and foggy. But there were no thunderstorms predicted until afternoon so we set out. 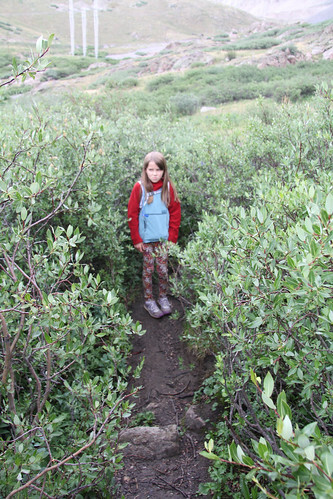 The trail starts by going through a patch of willows. 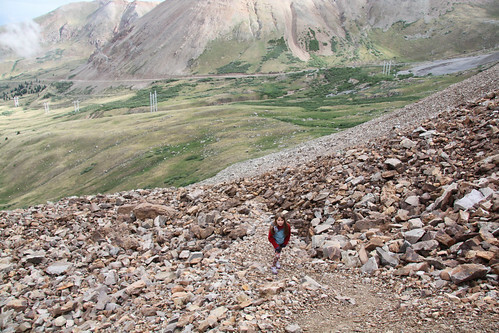 Any seasoned Colorado hiker hates these things. We inadvertently missed our first little turn because we cut the trail and ended up down in a marsh wondering how to get to the trail that we could see in the distance. The trail is that brown stripe between Sydney’s head and the snow in the picture above. 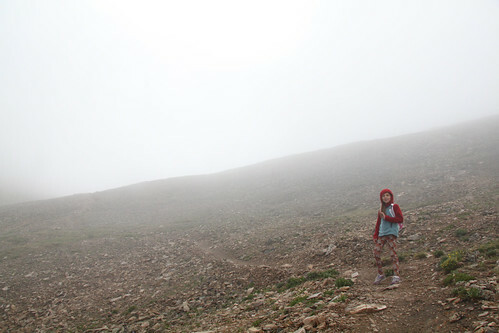 After soaking our feet, we ended up finding the trail to the high side and got underway properly. Just part of the experience. Here we look back to the willows with Mount Sherman up to the right. Let’s move it! I kept Sydney marching all day. Any stops were greeted with me telling her that doesn’t get her closer. We worked on pacing the whole time. Slowed it down to the point where there would be no stopping. Just constant forward motion. 2.5 miles to the top. Its gonna be steep too. As we started around the bend and into the gulch there was a sound of running water. We had crossed streams but this was a louder sound. 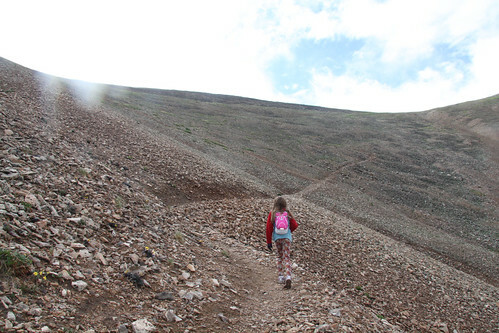 Sydney ended up seeing what it was first — a rock slide! Nothing to worry about. It was in front of us. But there was a stream of rocks falling down the mountain. We paused then proceeded when clear. Pow-hiking at 9! She was hands on knees without me telling her. You can see the truck along the road in the back near the powerlines. About a mile into the hike at this point. Somewhere in the mid 12,000 range. I started pumping her with gel blocks. Eat a gel. As we turned into the gulch, things steepened up. She was working. It was fun to watch. 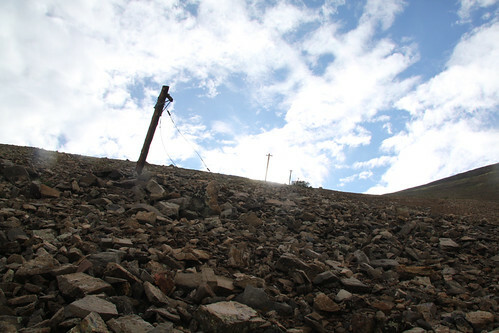 Old phone lines litter the mountain. Got back to some switchbacks as we worked to gain the ridge. I was filling her with useless trivia on 14,000 foot peaks. She kept telling me that there wasn’t a lot of oxygen. And then there was fog. The clouds were blowing in and we were quickly covered in a nice fog. The view went to little to none. But we heard voices. 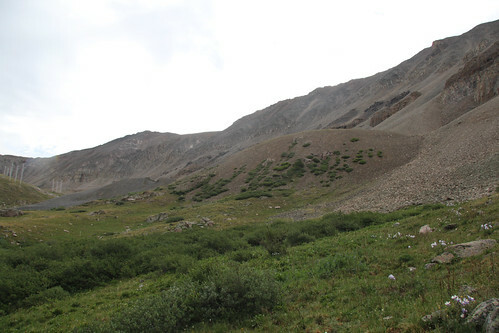 We had been alone so far but the trail was about to intersect with the east side trail. 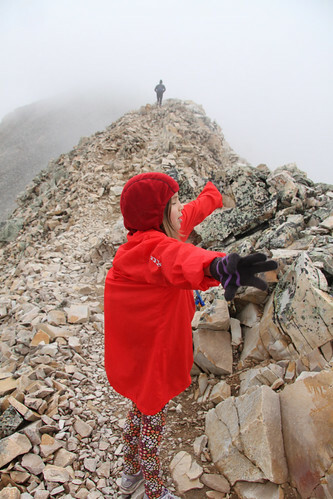 I pointed to the nearby ridge and asked Sydney what she saw. 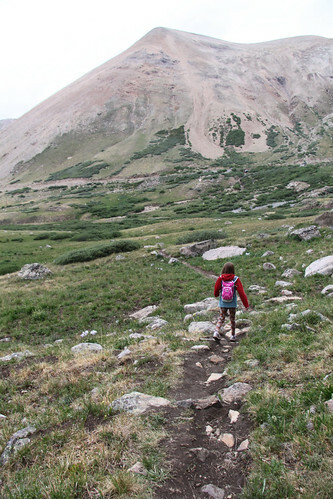 Looked like a pack of ants but there were hikers…about to be passed by a 9 year old. And with constant forward motion, we gained group after group. Came upon the usual other hikers that are of age and their friends talked them into this that are paused looking blankly upward. Then Miss Show Off comes flying by and they have to check themselves. Awesome. I was spouting off every 100 feet of elevation gain as a countdown. I thought it was motivating. 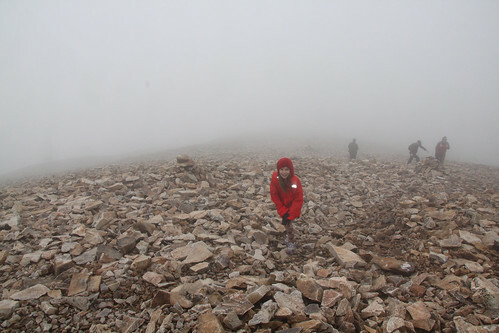 We were clicking them off fast but she worked hard from 13,500 to 14,000 where about we arrived on the final ridge line. 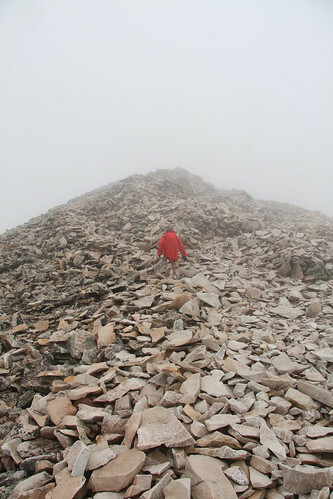 This is class 2 ridge but it always feels exciting and more like you think a 14er ought to be. 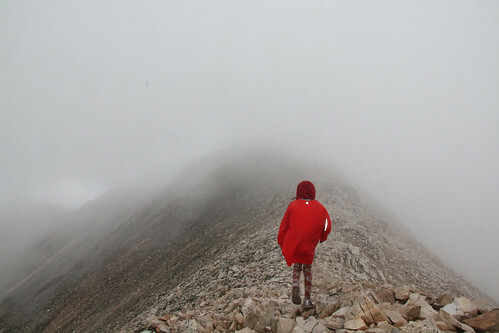 The fog on both sides killed a little of the excitement of plummeting to your death. 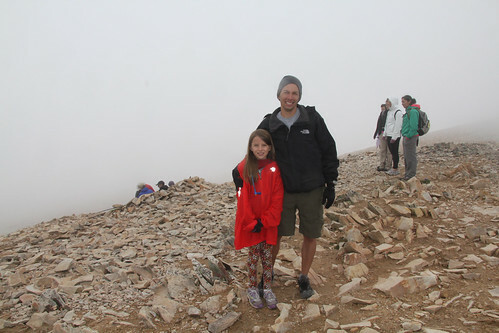 With a few hundred more feet of fairly flat walking at 14,000 feet, we arrived to a crowded summit. 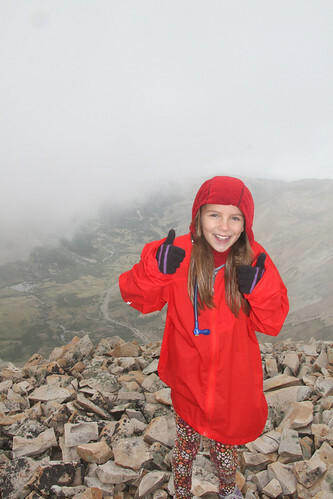 Her 1st 14er! 1:56 for those into these things. Busy summit given the weather. Me waving as Sydney took some photos. Not much of a view today. We stayed for 30 minute waiting but nothing. So we snapped what we could and headed out. Sydney had a fun time on the descent. Passing people and having them ask her how far it was, how old she was, how high it was, etc. It was very social. I found myself better when I lead as I could move into a slight jog and she would follow. Its just feels more efficient so I was grooming her. 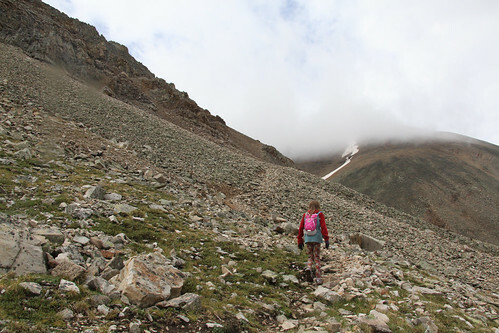 As we got to the lower ridge, she was reflecting on her achievement and jumped to saying “You will be so jealous when I finish 1st, 2nd or 3rd in the Leadville 100!”. Huh? “Sydney, I won’t be jealous, I will be proud!”, I told her. I told her that she has work to do to make that happen but when you make it happen people will say “Her? 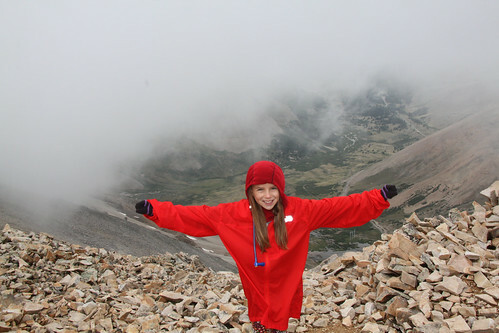 Oh, she was climbing 14ers at 9. Duh”. And then we were back to the willows. Sydney no like. Well, that was a success minus the lack of views. But she has seen it before. She was born here. Proud of her for doing it and being excited through the whole thing. I never really had any tough times or had to push. I just provided advice. I think she could have done it without me — but I wouldn’t have let her. Wouldn’t have missed it! Some video from the final bit. 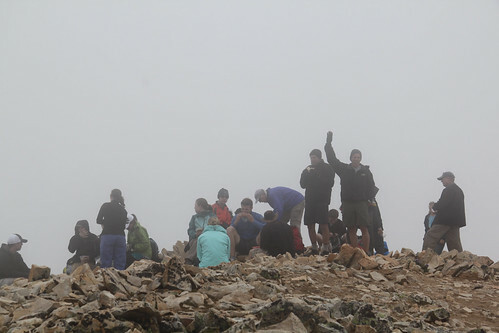 If you haven’t seen the top of a 14er in fog, it might be a good watch.